Yesterday was the first annual Quinte Bass Champs hourly weigh in tournament. My partner, Jared Blair, and I drove up Friday night, scoped out the launch, got our gear ready and then crashed for an early morning. After getting up at 4am, loading up the boat then making a stop at a busy Tim Hortons, we were at the launch by 5am. There were tons of boats already there so we launched and just floated around until the 6:45am blast off. We're somewhere in this group. The top 40 boats are ready to blast off at 6:45 AM. For us, the fishing was slow to start the morning. A pike and a few small perch were all we could muster in the first hour. Then, the bite for us was on. We spent the majority of the morning burning spinnerbaits over weedbeds, and that did the trick. I was throwing a white/chartreuse spinnerbait from Vinnerbaits, and I was able to nail a few Largemouth within a matter of minutes. Unfortunately, nothing with any size. And that was most of our day. Lots of Pike, and lots of average sized Largemouth - 2 to 3 pounds. Near the end of the day I was able to boat a few more 2-3 pound fish on a Krazee Kraw Beev from Vinnerbaits, but unfortunately, we walked away from this tourny out of the money. Overall it was a great tournament and a great experience. The biggest fish of the day was over 5 pounds and most of the winning fish were in the 3-4+ pound range. 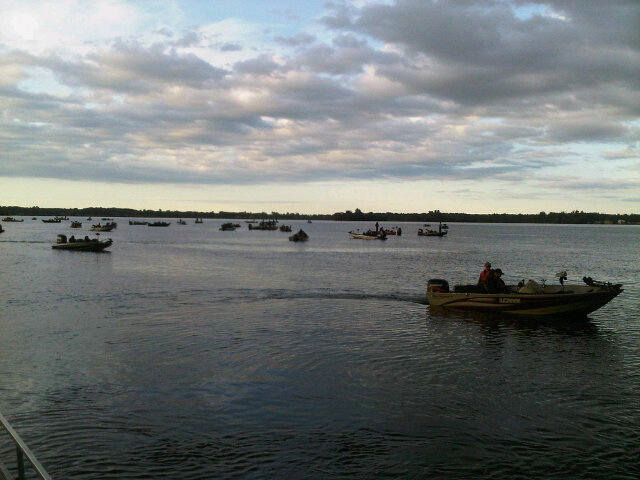 Having never fished Quinte before we did OK but it wasn't good enough. We'll get 'em next time! Congrats to everyone that got a cheque, there were some big fish weighed in.